For several decades, the main attraction in the small Texas town of Kerrville was the Arcadia Theater. 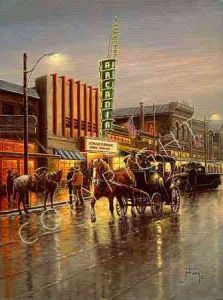 The Arcadia first opened its doors in 1926 and many celebrities including Will Rogers, dark Gable and the "Father of Country Music" Jimmy Rodgers were among the early patrons. Originally the theater was designed for vaudeville and other stage productions. In the 1940's the Arcadia hosted a radio show produced by KABC and in the late 1950's to early 60's was the site for several Miss Texas preliminary pageants as well as the pageant itself.